Are you sick and tired of living paycheck to paycheck? Break the cycle with Bank On. New classes beginning April. All free. No sales. No strings attached. 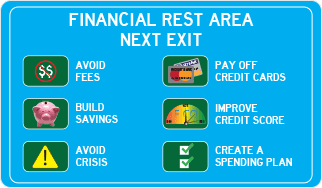 Just all the education, support and encouragement you need to get a fresh financial start. SIGN UP TODAY. This 10 month program is designed to help you build a financial plan bit by bit as you complete the financial challeges each month. It is time to break the cycle and reach your goals!